One of the world’s foremost researchers on pain, Dr. Lorimer Moseley defines pain as “… a multiple system output activated by an individual specific pain neurosignature; the neurosignature is activated whenever the brain concludes that the body tissues are in danger and action is required.” That’s a mouthful, but there’s a lot of really interesting and important stuff there so let’s break it down. All pain is real, but pain cannot exist until it is consciously experienced. Pain emerges when the brain has ‘decided’ it is necessary to create an experience to motivate a change in behavior or action based on a wide variety of factors (aka inputs) affecting the person. This idea is best illustrated by the pioneering pain researcher Ronald Melzack’s Neuromatrix theory of pain. 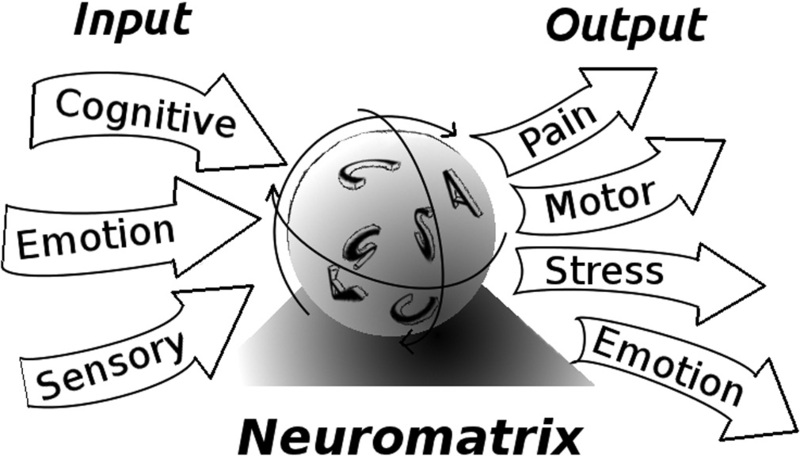 A simplified version of the Neuromatrix can be seen in the image below and the original image can be found here. To put this another way, pain is the result of the brain’s ‘opinion’ of a perceived threat to the body based on all available information. Pay special attention to the words perceived and opinion because pain, much like our senses, can be a poor indicator of reality. An example of how easily our senses fool us can be seen below. You’ll notice that in this image the top block will appear to be darker than the bottom block. 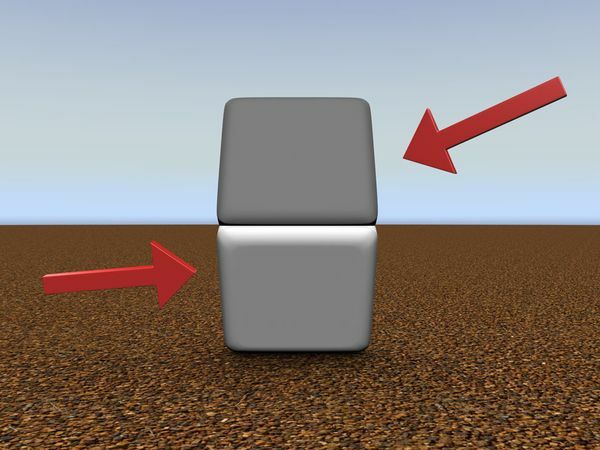 Cover the dividing line with your finger and you will see that the blocks are the same color. Claiming to know with certainty why different people do or don’t experience pain even in nearly identical situations is either unfounded or dishonest. The next time anyone tells you that anything directly “causes pain” you should be very skeptical. 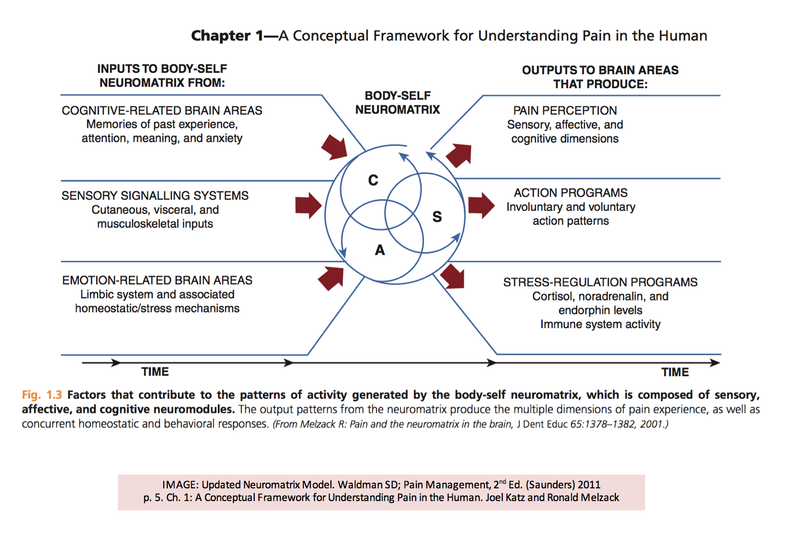 Many things have the potential to contribute to pain, but there is no simple singular cause. 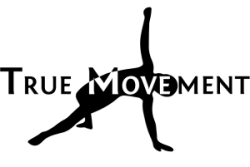 To be perfectly clear, weak muscles, bad posture, lack of flexibility, dysfunctional movements, asymmetries, unstable joints, alignment issues, anything to do with fascia, trigger points, or muscle imbalances do not directly cause pain. Some of these things may be related to the pain, but research has consistently shown that most of these ideas are not nearly as important as generally believed. This is not to say people can’t benefit when approaches that focus on these ideas are used, but when they do work it’s probably not for the reasons typically given. One of the only contributing factors that is strongly associated with the experience of pain is nociception. Nociception is a kind of information sent from special nerves present throughout the body that act like alarm systems for things that might be dangerous. Warning signals are created when these nerves are activated by heat, pressure, or chemicals in their surrounding environment. In most cases of chronic pain the nervous system becomes more sensitive so it becomes easier for these nerves to become activated and/or for their warning signals become amplified. Particularly in high stress situations it is not advantageous to a person’s safety to experience nociception as pain. The brain can produce chemicals so powerful that even traumatic injuries can be completely pain free. Consider the soldiers who sustain very serious wounds on the battlefield often will not experience any pain until they are safely in a hospital. You may also recall when Louisville men’s basketball player Kevin Ware suffered a dramatic compound fracture to his right leg In the 2013 NCAA playoffs. When asked about his injury Ware said, “I didn’t feel any pain. It didn’t hurt. Honestly, it didn’t hurt.” I won’t even pretend to speak for Ware, but I would guess he felt the outcome of the game was more important than his own safety. For most people paper cuts hurt a lot. Yet most people have also looked down at their hand at some point or another to notice their hand or finger is bleeding without having felt a thing. In both cases there are similar amounts of damage to similar locations with completely different experiences. How many times have you woken up to find a bruise that you have no idea where it came from? Do you know people with an “old injury” that “flares up” for a day or two even years after the healing process has finished? If experiencing pain was directly related to the amount of tissue damage present none of these things would be possible. Additionally, a huge number of imaging studies have shown high percentages of completely pain free and fully functional individuals who have apparent damage, “abnormalities”, or degeneration. Backs and necks were found with bulging discs, stenosis, herniations, and nodes. Shoulders were found with partial or full thickness tears of the rotator cuff. Hips were found with torn labrums. Knees were found with meniscal degeneration or tears. Arthritis has been found in a variety of places. Yet all of the people imaged had no pain at all, and some were even athletes performing at high levels. From this research it is abundantly clear that the structures of your body alone do not dictate if you will experience pain. No one knows for sure what determines the amount of pain experienced, but researchers over the past 30 years have hit on something big. While it’s always worth seeing a professional to rule out pathology, once you understand that pain is not necessarily related to anything physically damaged, then you can begin to accept that your pain may be a result of a sensitive nervous system. Or that a sensitive nervous system is amplifying the threat signals that may be coming from the tissues. Remember that pain is an opinion based on perceived threat, so your beliefs, fears, expectations, and outlook can heavily impact how threatening a stimulus may be. This is probably (in part) why people with depression have a much higher incidence of pain. There are even some cases where beliefs alone have been shown to cause a great deal of pain. In this case report, a builder was admitted to the ER because a large nail was driven through the bottom of his boot. He was in such debilitating pain that he needed to be sedated for the nail to be removed. 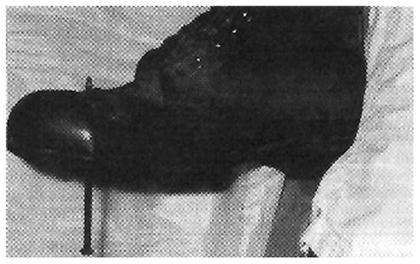 After the removal of his boot it was discovered that the nail had gone between his toes and had not left a scratch. There is an ever growing body of research that shows that pain education in conjunction with other rehabilitative treatment(s) produces favorable results even where many others have failed. There is even some promising evidence that understanding pain can be useful in the prevention of future pain. All of this is especially important in cases of chronic pain where many people could previously find no relief or understanding, and offers great hope for the future of treatment and prevention. Pain can be thought of as the conscious experience of the brain’s opinion that something is a credible threat to the person. Most pain becomes present when a physical and/or mental stimulus is decided to be both relevant and threatening based on experiences, culture, beliefs, expectations, and context. Because pain is based on the sum of so many factors, changing any of these factors (including beliefs) has the potential to influence how threating something seems. By using this framework to guide the treatment and management of pain, there has been great progress and promise in the treatment of even difficult chronic conditions. Pain is unpleasant, but it is also very important for survival. People who are born without the capacity to feel pain die very young because they are completely unable to identify potentially threatening situations. Ignoring pain will not make it go away and it will often make things worse. In most cases it’s worth seeking care from a provider who understands the treatment of pain. Are you saying injuries don’t matter? Injuries are often involved in pain at first, but there are a very large number of examples where individuals show damage with absolutely no pain. Pain and injuries can both be important, but the terms cannot be used interchangeably. The book(s) Why Do I Hurt by Adriaan Louw and Explain Pain by Lorimer Moseley and David Butler. There are also many great free and entertaining videos of Moseley and Butler that are available on YouTube. There is no better resource on the web for understanding pain than the forums at www.SomaSimple.com Be prepared to defend what you say if you post, but if you stick around you will learn more in less time than many do in years of university study. This article was originally written for fitness enthusiasts and posted on Dean Somerset’s website here: http://deansomerset.com/a-primer-on-pain/ – I’d like to thank Dean for the opportunity to gather my thoughts and share this important information.